A lot of speculation has been circling Sandman since the first news that Joseph Gordon Levitt was searching for the right director to bring it to the big screen but why THIS story? If you are wondering what is different about the Sandman, well this should help. The devil, Satan, El Diablo, Mephisto, Lucifer; there have been many versions of the ruler of Hell in comic books, none like this for one reason, the writer is Neil f#*$in’ Gaiman!! This Lucifer is not a cliche Al Pacino fuming mad at God or the world at large he has his own plans that are selfish and unexpected as you could hope. Our “hero” is nothing but a dream, called ironically Dream, arriving in Hell to save a woman he once loved, yet sent to Hell! There is only one thing in the way, Lucifer, a being that is much more powerful. Given equipment he hopes might help him survive the battle. This sounds like a comic book superhero battle in the making right? The weaker yet noble hero will surely bring you the righteous power needed to win the day!! Well, not in a Neil Gaiman book… BOOM!! You want to know the rest? If not you are a robot!! Magic is sown in and out of the legendary Neil Gaiman's Sandman. No epic battle like you would think, instead a twist like none other with Lucifer's crooked smile to making you feel unsettled. If you want to know the rest, afraid you'll have to read it but trust me, it's a good rabbit hole to fall down. This the same lucifer from that Lucifer 1 series? I haveno knowledge of Sandman/lucifer/deaths world, but I do have sandman 1 and 2 TBP’s ill need to get them out the closet and read them now! Lucifer: Are you scared of me? I don’t know why but I thought this was kind of funny. Just finished reading issues 48-75 and Morpheus just may be my favorite comic “hero” of all time. Great stuff!!! Neil Gaiman and Alan Moore are in a class by themselves (respectively) when it comes to writing. 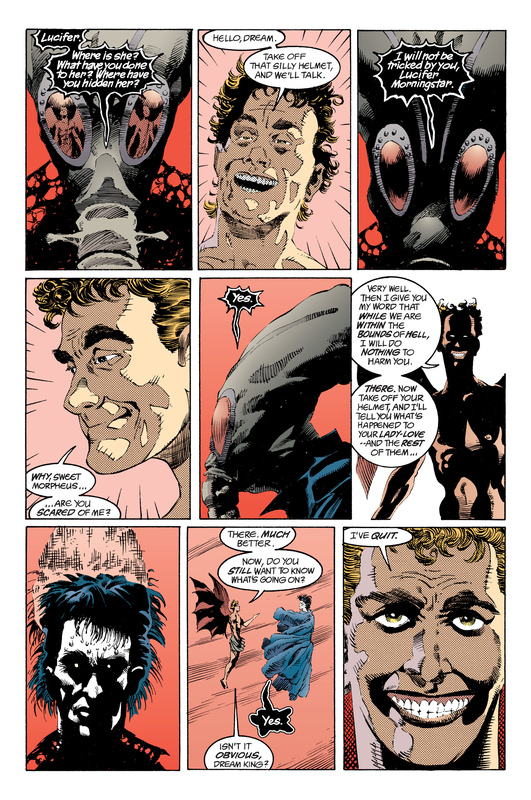 If you haven’t read Sandman you are missing out on a whole different concept of what comics can be.